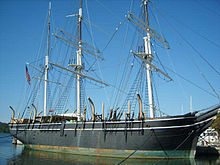 A preserved whaling ship which frequented New Zealand waters, the Charles W. Morgan. The Māori, who were the first to settle in New Zealand, appear to have hunted whales rarely, but did eat stranded whales. The earliest association of whaling with New Zealand is from December 1791, when the whaleship William and Ann called in at Doubtless Bay during a whaling voyage of the Pacific. It is not recorded if any whales were actually caught in what are New Zealand waters. The Britannia arrived about the same time. Both were whalers that had dropped convicts at Sydney. In the early 19th century, Kororareka (now called Russell) was a supply port for whaling and sealing ships, and developed a wild reputation being called the Hellhole of the Pacific by Charles Darwin who did not like his time in New Zealand. His opinion reflected that of many of the puritanical evangelical Christian missionaries. This behaviour was not just confined to the Bay of Islands. Missionary John Brumby in Marlborough in 1838, found the whalers to be "rogues and outlaws unrestrained by any law" Other contemporary observers had differing views. In 1839, Edward Wakefield, who later became a member of parliament in Britain, described shore whalers as having a dark side to their character but they were "frank and hospitable". They were intrepid with boundless resolution and great powers to endure hardship. He pays tribute to their hospitality to casual visitors and noted they were in stable relationships with Maori women, such as Te Wai Nahi of Te Atiawa, with whom they raised large families. His sentiments are echoed by his uncle, Colonel William, who was no advocate of working men. Other early whaling ships were the Foxhound, a London whaler, in 1827 and the Waterloo, which operated between Cloudy Bay and Sydney from 1829, taking 3 cargoes per year and returning with supplies and trade goods to exchange for flax. By the 1830s most whaling, apart from American ships, was done from shore bases with mixed crews of Maori and European sailors. In the first half of the 19th century, almost a hundred small shore stations were established - in the South Island at Te Awaiti and Preservation Inlet and later at Stewart Island, Otago, Timaru and Kaikoura and Cloudy Bay. On Banks Peninsula the first shore was at Little Port Cooper in 1836 and by 1842 there were a total of five stations, including Oashore Bay, Ikoraki and Peraki. North of Wellington, there were three whaling stations at Porirua, and five on Kapiti Island. Further north there were also shore stations at New Plymouth and Great Barrier Island. However, by 1840 the whale numbers had declined to the point that little money was to be made, and in 1844 the last of the early onshore stations closed. A later shore station, Perano's of Tory Channel, Cook Strait caught 4200 whales (mainly humpback) between 1911 and 1964, when the last whale was caught in New Zealand waters. Since 1978, whales within New Zealand’s 200-nautical-mile (370 km) Exclusive Economic Zone have been protected under the Marine Mammals Protection Act 1978. Killing a whale or other cetacean is punishable by up to six months imprisonment, or a fine of up to NZ$250,000. Efforts are now often made to save whales that have stranded or have become entangled in marine debris. There is a vocal antiwhaling sentiment in New Zealand. The Government regularly attends the International Whaling Commission meetings and supports the moratorium on whaling, as well as advocating for the creation of whale sanctuaries. In 2010, Peter Bethune, an antiwhaling activist, was detained by Japanese whalers when he boarded a whaling ship in the southern oceans. He was convicted in Japan and deported back to New Zealand. ^ Taylor, Rowan (1997). Ian Smith (ed.). The State of New Zealand's Environment 1997. New Zealand: Ministry for the Environment. ISBN 0-478-09000-5. Retrieved 2008-11-12. ^ Before Hobson. T Simpson. Blythwood Press. Wellington 2015. p 108. ^ T Simpson .p 109-110. ^ a b Jøn, A. Asbjørn (2014). "The whale road: Transitioning from spiritual links, to whaling, to whale watching in Aotearoa New Zealand". Australian Folklore: A Yearly Journal of Folklore Studies (29): 87–116. Retrieved 9 February 2016. ^ Prickett, N. 2002 "The Archaeology of New Zealand Shore Whaling", Wellington, Department of Conservation. ^ Otago Witness 29 March 1879, p.24. ^ Marine Mammals Protection Act 1978, section 9(1). ^ "Environment". Ministry of Foreign Affairs and Trade. 14 January 2010. Retrieved 21 July 2010. Jøn, A. Asbjørn (2014). "The whale road: Transitioning from spiritual links, to whaling, to whale watching in Aotearoa New Zealand". Australian Folklore: A Yearly Journal of Folklore Studies (29): 87–116.